The integration of legacy systems and modern technology is sometimes a challenge in the creation and maintenance of robust industrial environments. The maintenance cost and shortage of spare parts for old equipment creates a financial burden and production risk that raises questions - is there a better way, can we leverage the cost and energy efficiency benefits of newer technology? In response to a customer requirement to retain his existing PLC (with unmodified code) but over time migrate legacy drives to modern drives we have created a gateway/converter that allows them the freedom to upgrade equipment incrementally. In their case a number of drives are controlled over a multi-drop RS485 network using the GEM80 Starnet HDLC protocol. Our gateway provides access to the original HDLC network and also to a parallel PROFIBUS network. 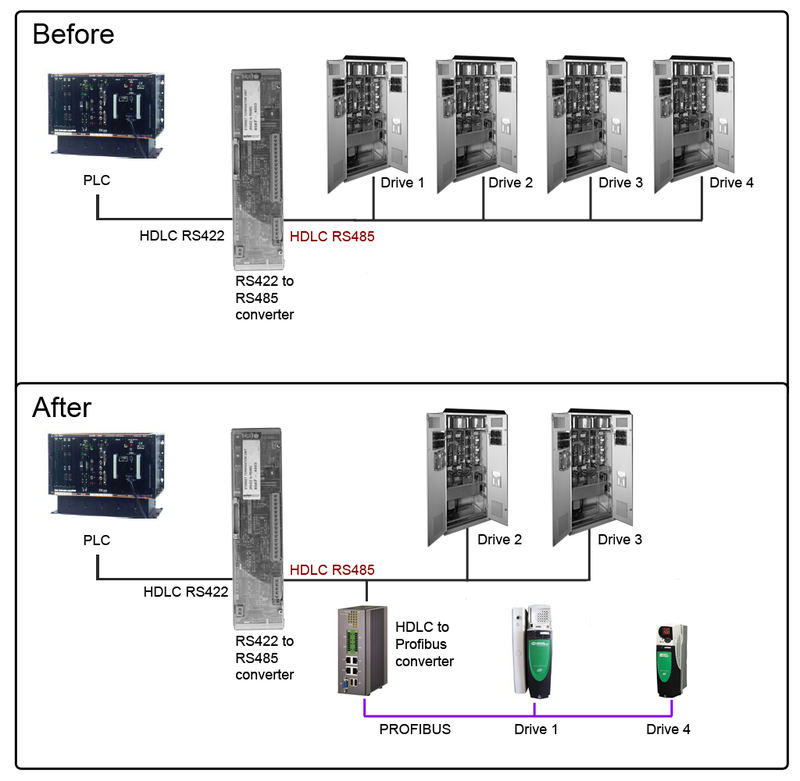 It is possible to disconnect a legacy HDLC controlled drive and enable a modern replacement drive on the PROFIBUS network - the PLC is not aware that anything has changed - our gateway does the necessary data mapping and error management. Our gateway is generic and can be extended to handle similar requirements with other leagacy and modern fieldbus or industrial ethernet standards. 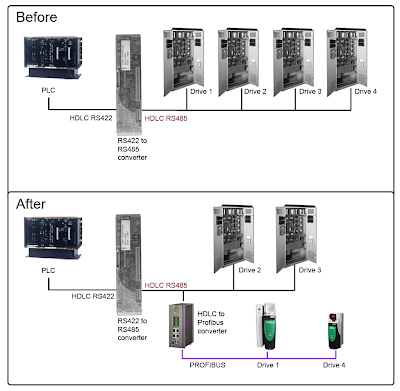 Below is an indication as to the integration you are now able to create with your legacy HDLC PLC network. As you can see from the image above we have replaced the legacy drive 1 and 4 with modern PROFIBUS drives which are able to run in parallel with legacy drive 2 and 3. As far as the PLC is concerned it is still talking to a legacy drive on address 1 and 4, but the HDLC gateway is doing all the conversion necessary to control the PROFIBUS devices.